The “vampire” skeleton, unearthed during archaeology excavations in the Bulgarian Black Sea town of Sozopol, has been included in the National Geographic ranking of the 10 most popular news pictures for 2012. Everyone loves vampires. “The discovery of a 700-year-old skeleton in Bulgaria—seen at the country’s National Museum of History in June—offers evidence that the fear of vampires is far older than Bram Stoker’s Dracula. The National Geographic TV channel has already aired a documentary about the vampire, featuring the historical town of Sozopol for the second time, after a documentary about the relics of St John the Baptist, also discovered there. The skeleton was of a man with an iron rod in his chest, which was believed at the time to prevent corpses from rising as a vampire. National History Museum Director Bozhidar Dimitrov explained the vampire’s name was Krivich (The Crooked) and he was a legendary pirate, manager of the Sozopol fortress or one of his heirs. The Crooked, as his contemporaries called him, was a crippled, but extremely intelligent man. His knowledge about the sea, the stars and herbs outranked everyone’s. Byzantine chronicles describe how he plundered a Venetian ship. His grave was discovered near the apse of a church, which suggests that he was an aristocrat. 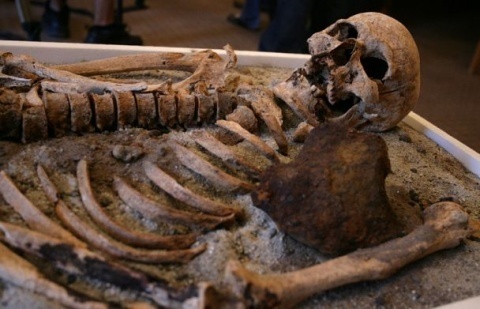 According to archaeologists, this is the first time a “vampire” burial has been discovered in Sozopol. Not only has this vampire’s picture gained popularity, but according to tour operators, the interest has been huge and Germans and Brits have inquired about “vampire vacations” in Sozopol. For more on the “vampires” discovered in Bulgaria read HERE.